Thank you to everyone who attended the Pension Academy! 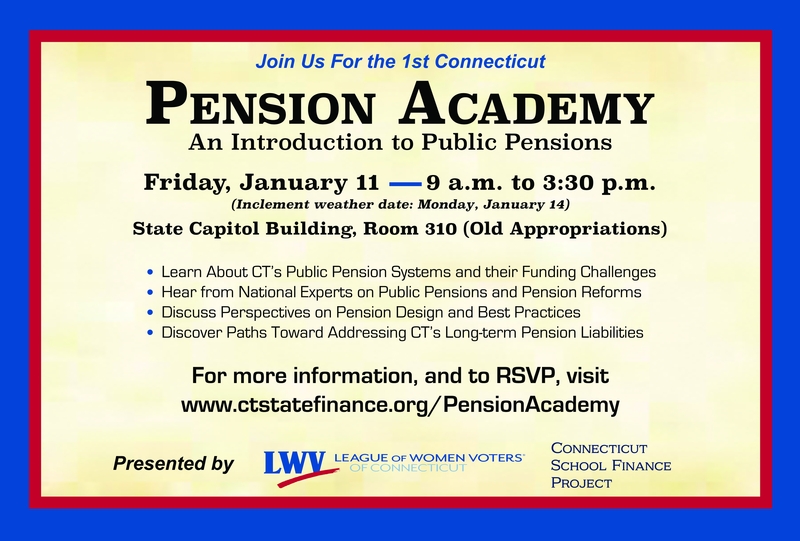 The Connecticut School Finance Project and the League of Women Voters of Connecticut were proud to present Connecticut's first Pension Academy on Friday, January 11, 2019 at the Connecticut State Capitol. Below is a full video of the Pension Academy. Under the Agenda and Presentation Links section below, you can find individual links to all of the presentations made during the Pension Academy. For questions or comments, please email us at info@ctschoolfinance.org. What is the Pension Academy? The Pension Academy is a daylong, nonpartisan event dedicated to examining the State of Connecticut's unfunded pension liabilities and their impacts on the state budget, while learning about potential ways policymakers can improve the financial viability of Connecticut's public pension systems and address some of the looming financial challenges facing the state. Open to state and local policymakers as well as the general public, the Pension Academy will feature some of the nation's preeminent experts on public pension design and funding. What is the purpose of the Pension Academy? Pensions are a key benefit for Connecticut state employees and public school teachers. However, for a variety of reasons, Connecticut’s two largest state pension systems — the State Employees Retirement System (SERS) and the Teachers’ Retirement System (TRS) — have tens of billions of dollars in unfunded liabilities, which pose difficult, long-term financial challenges to the State of Connecticut. With one of the highest pension obligations per capita of any state, the State of Connecticut's Annually Required Contributions to SERS and TRS now comprise a quarter of the state budget. In fact, since FY 2000, Connecticut’s contributions to SERS and TRS have increased by $742 million (239%) and $974 million (328%), respectively, and are projected to increase over the next decade in order for the State to make good on its promises to retirees and current employees. The Pension Academy is intended to not only shed light on Connecticut's growing pension costs and funding challenges, but to provide policymakers and the public with an awareness and an understanding of potential paths forward. By bringing together national experts on public pensions to discuss pension system designs, reforms, and best practices, the mission of the Pension Academy is not to simply add to the ongoing conversations about Connecticut's pension funding crises, but to equip policymakers and their constituents with the tools, resources, and knowledge needed to turn those conversations into constructive action.